You can never have too many chicken recipes right? Especially when they are this good! I can’t get over how amazingly delicious this Skillet Chicken with Creamy Spinach Artichoke Chicken is! It is definitely one of my new favorite ways to make chicken! I made this over the weekend and my family enjoyed it so much so here I am again making it on again on Monday so we can have it again, and of course so I can share with you guys. 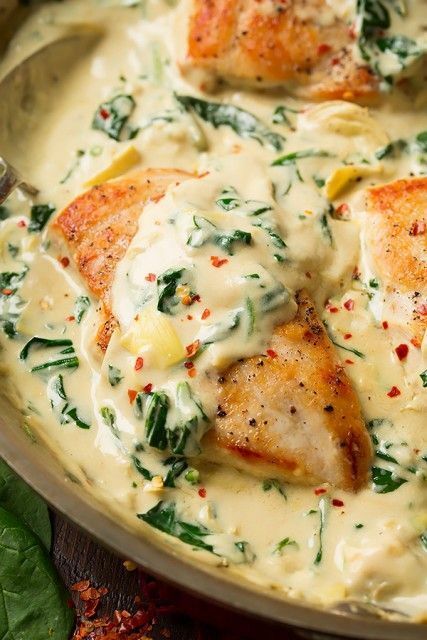 You just can’t go wrong with skillet chicken and a good sauce! Pound chicken to an even thickness using the flat side of a meat mallet. Season both sides with salt and pepper. Heat 1 Tbsp olive oil in a large skillet over medium-high heat. Add chicken and cook until golden brown on bottom, about 4 - 5 minutes. Rotate chicken to opposite side, add remaining 1/2 Tbsp olive oil and continue to cook until chicken is golden brown on bottom and center registers 165 on an instant read thermometer, about 4 - 5 minutes longer. Transfer chicken to a plate, cover with foil to keep warm. Melt butter in same skillet used to cook chicken over medium heat. Add garlic and flour and cook 30 seconds then add in spinach and artichokes and saute until spinach has wilted, about 1 minute. Pour in milk, while scraping up browned bits from bottom (don't worry if you can't get all of it, the golden bits will come up as it continues to cook). Add in Neufchatel cheese and parmesan, season with salt and pepper to taste, and cook and stir until mixture has thickened slightly and cheeses have melted. Stir in sour cream then return chicken to skillet. Sprinkle with red pepper flakes and serve warm with cooked orzo if desired. 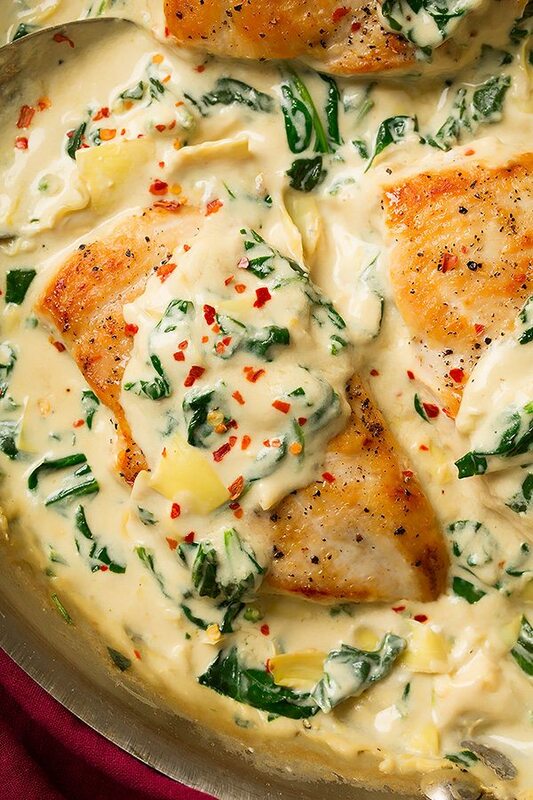 0 Response to "Skillet Chicken with Creamy Spinach Artichoke Sauce"